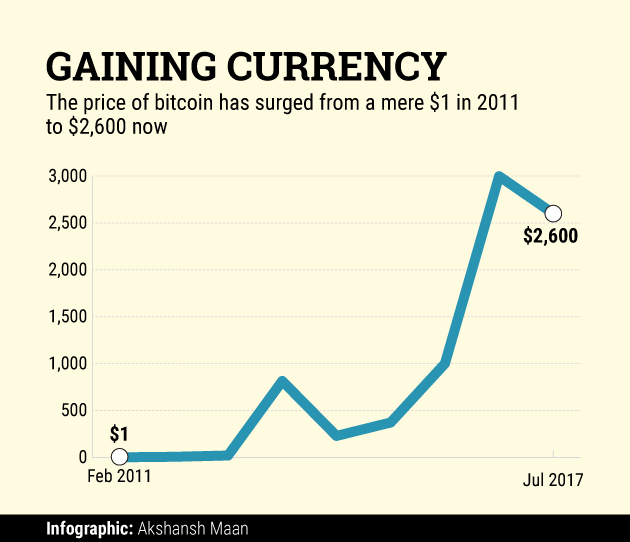 Bitcoin, the world's first cryptocurrency, has seen its value skyrocket over the last six months. Its price, which hit an all-time high of $2,900 (over Rs 1.87 lakh) last month, is currently around $2,568 (over Rs 1.66 lakh), and Goldman Sachs predicts it will go past $3,915 (over Rs 2.53 lakh) if one stayed invested long enough. However, in India, not only is the technology nascent, but there are also questions around bitcoin's legality. A few months ago, media reports quoted a Union minister as saying that using bitcoin in India was illegal and could attract a penalty under anti-money laundering laws. But the report turned out to be unsubstantiated. The Reserve Bank of India has stepped in and formed an inter-disciplinary committee to discuss the legality of cryptocurrencies. The committee is expected to submit its report by the end of July, and it is widely expected that it will propose making virtual currencies legal in India. The absence of a regulatory framework for bitcoin, however, is not an India-specific problem. Governments and users around the world are still getting used to the idea. However, the ecosystem has got a boost of late with the Philippines and Japan legalising bitcoin and related businesses, and Australia confirming it will treat bitcoin just like money and not levy double taxation on it. That bitcoin is illegal in India is a myth that needs to be broken, says Saurabh Agrawal, co-founder of Zebpay, a bitcoin exchange. "Bitcoin is legal in the US, EU, Japan, etc. Even in India, it is legal as per all existing laws. More than a lakh merchants accept bitcoins worldwide...Just that you buy or sell at your own risk," he adds. Despite the regulatory uncertainty and nascency of the market, several bitcoin startups and exchanges in India have taken the leap of faith. But before we get there, here's a quick overview of the ecosystem. The bitcoin network consists of miners, exchanges, independent wallet service providers, and blockchain applications. Bitcoin mining is how transactions on the network get processed. People have to compete to 'mine' bitcoins, using computers to solve complex math puzzles. The winner of each block gets fifty coins for the first four years, twenty-five coins for the next four years, and half as much again every four years. The creation of new coins will halt after 21 million coins are released into the world. 16 million coins are already in circulation. For the ecosystem to take off, an exchange is the first infrastructure that needs to be built. "It's the exchange that provides value to the currency and to these digital tokens. And these digital tokens are the revenue for the other part of the ecosystem, called miners. Miners play the role that traditional financial companies have. They actually verify and record the transactions in a de-centralised way," says Sandeep Goenka, the other co-founder of Zebpay. Just like people keep gold in the locker for security, there are independent wallets where investors can store their bitcoins. Bitcoin exchanges also offer wallets. Blockchain, a term often confused with bitcoins, is the technology behind cryptocurrencies. Actually, blockchain is a public ledger (decentralised database) that stores and validates bitcoin transactions. If a transaction gets recorded in a blockchain section, it becomes immutable. "Blockchain is just a technology. Imagine blockchain to be the Internet and bitcoin to be first website on this," Nikunj Jain, co-founder of Darwin Labs, a startup studio and incubator, explains. Although many startups have come up in the space over the last two years, most of them are blockchain ventures and not pure bitcoin players. That's mainly because, unlike bitcoin, blockchain is not shrouded in regulatory issues in India. In fact, several prominent Indian banks have started research and development activity on blockchain. Last year, as many as 32 blockchain firms were founded in India, show data from audit and consultancy firm PricewaterhouseCoopers. In the years before 2016, just 23 were founded. Currently, three to four Indian startups operate as bitcoin exchanges. "The number of blockchain startups is considerably smaller than the number for other industries, but it is growing slowly as coders and developers start tinkering with blockchain and target solutions for both fin-tech and non-fin-tech domains," Jain says. Zebpay, Coinsecure and Unocoin are India's leading bitcoin exchanges while Signzy, RecordsKeeper, Psi Phi Global, Primechain Technologies, KrypC, and EzyRemit are some notable blockchain startups. "Blockchain has multiple applications and some of the business models are digital ID management, product provenance, and cross-border remittances," Jain adds. India doesn't have a bitcoin miner or wallet provider yet. The price of bitcoin has surged 210% over the past year, and the cryptocurrency's market capitalisation stands over $44 billion. It has also got a serious push with countries like Japan, the US and Singapore already accepting bitcoin as a medium of exchange. China reportedly trades bitcoins worth Rs 5,000 crore per day. Japan isn't very far behind on the consumption scale either. Globally, exchanges together clock Rs 20,000-30,000 crore a day. In India, however, the market is a fraction of Japan and China. That said, India has the potential to emerge as a leading global market for bitcoin, says Sathvik Vishwanath, CEO and co-founder of bitcoin exchange Unocoin. Of late, the startup claims, it has grown 15% month on month by volume and 20% month on month by user base. Zebpay, with over 7 lakh downloads, claims it traded Rs 1,200 crore worth of bitcoins last fiscal. "In India, the daily trading volume is estimated at Rs 50 crore. There is massive scope for these numbers to increase," says Zebpay's Goenka. All three bitcoin exchanges in India have managed to raise initial funding. In January last year, Ahmedabad-based Zebpay secured around $1 million in Series A funding from Claris Lifesciences CMD Arjun Handa, Jindal Worldwide MD Amit Jindal and other unnamed investors. In September 2016, Unocoin raised $1.75 million in a pre Series-A round from Blume Ventures, Mumbai Angels and ah! Ventures, apart from some international investors. Coinsecure, too, raised over $1.2 million from a group of undisclosed angel investors last year. 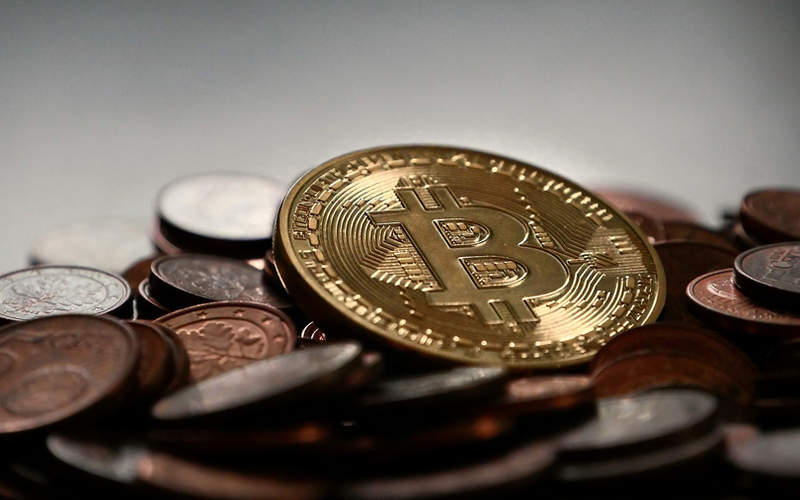 However, the fund-raising figures seem pale in the light of the fact that as many as 55 bitcoin and blockchain startups have been floated in the last two calendar years. What's holding back these ventures from raising capital? "Bitcoin startups find it difficult to raise funds because VCs feel there is no regulatory clarity. In terms of funding, we are far behind the western world. Of the total funds raised worldwide by bitcoin startups, India accounts for less than 1%," says Goenka. Moreover, though 55 might look a big number, investors find it difficult to find potential investment opportunities as they look for specific use-cases. But Harmeet Singh Monga, program head at Southeast Asia-based blockchain incubator Satoshi Studios, agrees with Jain that the emergence of blockchain startups with targeted solutions for both fin-tech and non-fin-tech will ensure a steady pipeline of ventures in future. Then, there is the issue of investors not being fully aware of the technology and, consequently, the entire scope of its applications. "Not many investors understand this technology. As more success stories come to the market, investments will pick up in 3-5 years. Globally, there are dedicated VC funds investing in blockchain startups," says Darwin Labs' Jain. To address the lack of regulation, bitcoin startups in India have come together to float the Digital Assets and Blockchain Foundation of India (DABFI). The aim is to create a self-regulatory body that brings in uniform rules. The stakeholders in the ecosystem unanimously feel that once the regulatory hurdles are cleared, funding will start coming in. "When legality happens, the ecosystem will grow at a faster pace. There will be better user protection and prevention of illicit use. The moment we get government support, we will see a lot of development, innovation, disruptive products and, with that, institutional investors investing in the space more actively," says Goenka. 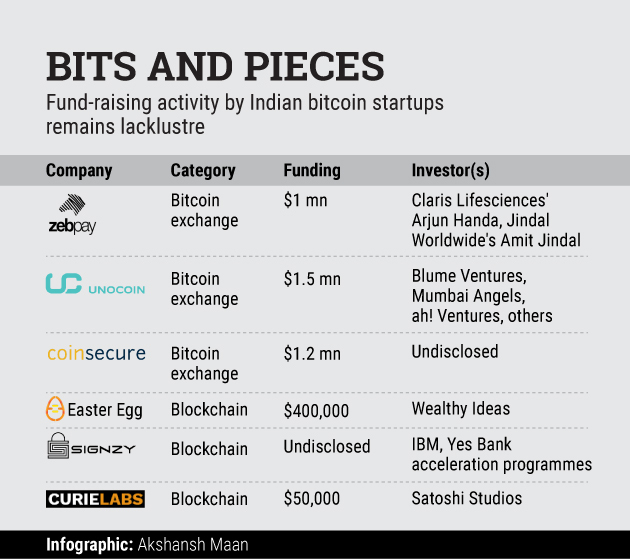 All in all, bitcoin startups in India seem poised to take off but for regulatory uncertainty. Till that happens, they will have to keep taxiing on the runway.